Anyway, back to books. So, next up is Sukkot and we’re just going to go with a roundup on this one. Here’s what I see as the best books out there on the ole Festival of Booths. OK, the pictures are a little corny and old fashioned which gets points deducted in my book, but the story is lovey. Tamar is building her sukkah and each page, there’s something she needs help with, so she finds another child to help. But even when that task is complete, Tamar says that: “Something’s still missing.” It turns out that only when there are friends to share the sukkah is the sukkah really finished. I’m giving this age group a tie. I’ve talked about both of the series before so I won’t dwell on them here. Younger kids seem to really like the “It’s [insert holiday name] Time!” stories which take place in a lovely looking Jewish preschool. 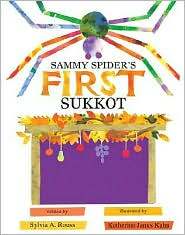 In this book, the kids learn about sukkot, decorate the sukkah and create little miniature sukkahs. In terms of Sammy Spider, kids seem to love him, though adults grow weary of him (and his mother’s penchant for dwelling on all things spiders can’t do…). But, Sammy does learn all about Sukkot in the latest installment of Sammy’s adventures in the Shapiro house. So here, it’s not so much a tie as a split based on what kind of family you live in. 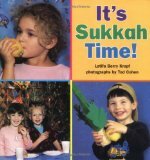 Leo & Blossom’s Sukkah (which is sadly out of print) is great for children in a variety of different homes. Zalben, who has created two main series of stories about little animals that live in Jewish homes and celebrate Jewish holidays, here tells a lovely Sukkot story. The pictures are very small but it’s a nice story and there are many more where that one came from. The story is also anthologized in Beni’s Family Treasury where you’ll find many more stories like it. Hillel Builds a House is also a lovely story (with very out of date illustrations) but it’s better for families that actively celebrate Jewish holidays on a regular basis (which does not just mean Orthodox folks). Hillel loves to build houses and wants to always have his own little house. Every holiday, starting with Hanukkah, he tries to have his own little house (at Hanukkah he builds it in the basement but he can’t light his candles in it; on Purim he makes a house costume but it gets rained on; etc. etc.). Finally, it’s Sukkot which is a perfect holiday for building a house! Night Lights is a great story by Barbara Diamond Goldin about sleeping outside in a Sukkah. While last year, Daniel (who you may remember from the Rosh Hashanah story: The World’s Birthday) was OK sleeping outside because he grandfather was there, this year he is scared to do it. Not making things easier, his big sister Naomi keeps telling him that he won’t be able to do it because he’ll be too scared. In the end, even Naomi is scared and they realize that being together, they can make it through the night. I like this story a lot, but I am a little disappointed in the re-illustration that was done when the book was re-released. So, on the one hand, I fully support buying the edition in print because then the money actually goes to the author, but on the other hand, the artwork in the original edition (by Louise August) is exceptional and I would advocate buying that edition, even though it’s used. The one other note I would make is that the new edition (published by UAHC Press/ URJ) is less scary than the old edition because the illustrations are less intense. So, decide on your own — or get both and compare! It is said that our forefathers, Abraham, Isaac, and Jacob, return to Earth for the harvest festival of Sukkot. Disguised as weary travelers, they appear at the sukkah, asking to share the holiday meal. If they are welcomed as honored guests, they leave a blessing. If not, they teach a lesson that is not soon forgotten. The Mysterious Guests shows us how some people who have much to give, give so grudgingly, while those with little to give, give all they can. It’s a lovely lesson about tzedakah and a model of how to greet guests. I’m trying hard to stick with books that are still in print, to make it easier on everyone. But every so often, I’m going to need to go back to some lovely books that you are going to need to hunt around a little bit for. 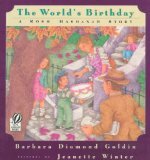 It would be hard to talk about Rosh Hashanah books without mentioning The World’s Birthday by Barbara Diamond Goldin. Goldin is one of the top Jewish children’s book authors with so many wonderful folktales and stories to her credit. They are all gems and you will hear about many of them on this site. The World’s Birthday is a great story for 4 and 5 year old children. Daniel, the hero of this story (and of another Barbara Diamond Goldin book Night Lights) thinks that if Rosh Hashanah is the birthday of the world, why not throw a birthday party? And while his older sister Naomi (who also features prominently in Night Lights) thinks it’s a dumb idea, he perseveres and creates a lovey new Rosh Hashanah tradition. It’s a nice, quiet story, perfect for children who love birthday parties. It may be hard to find, but it’s worth it once you do.